I’m not really a trendsetter or a trend follower. Ever since I was a little girl, I always seemed march to the beat of my own drum. 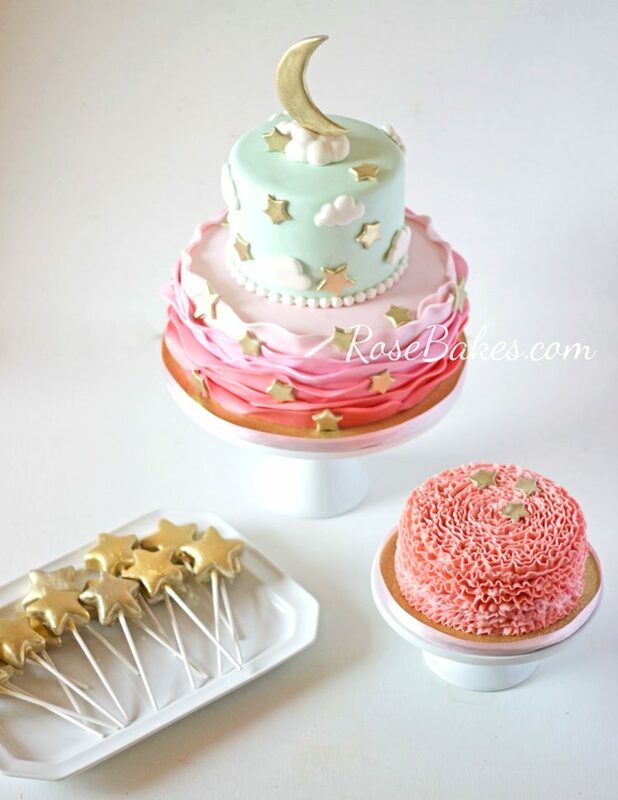 But when it comes to cake, I’ve noticed that there is always something trendy that everybody wants! For the past several months – one of those trends has been GOLD! As it turns out, I’ve done lots of metallic, shiny, pretty cakes and I have quite a few more on my schedule. 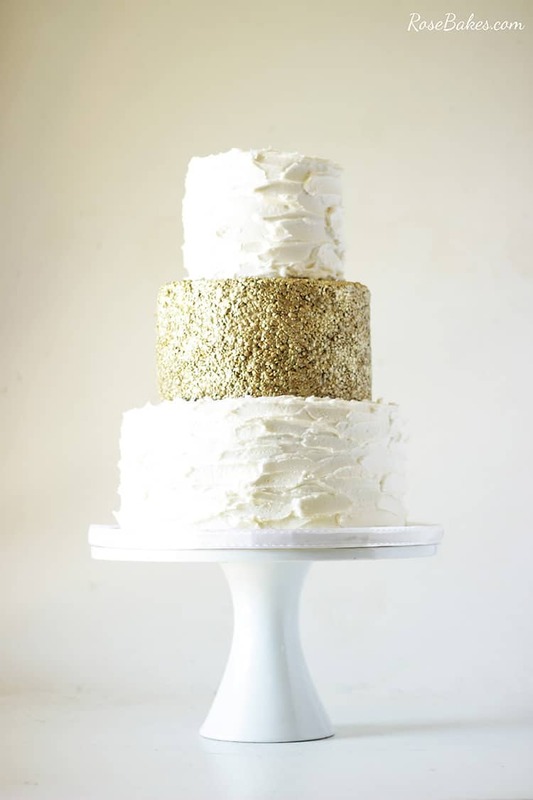 I don’t want to wait to share them all, so for now, Check out these Trendy Gold Cakes that I’ve already done! First up – this lovely 50th anniversary cake that I delivered on Friday! 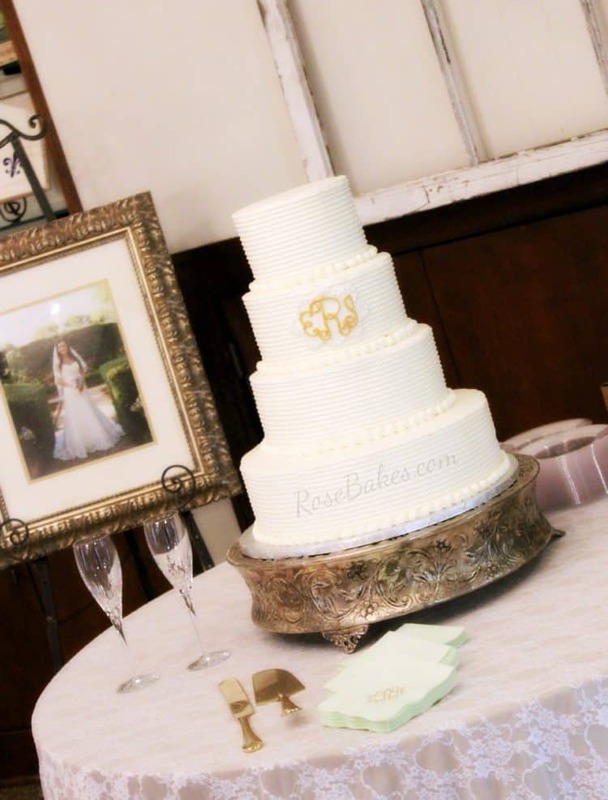 It was hand-painted gold and sugar magnolias… and I was thrilled with how it turned out! Update: several peeps have asked about the gold. I used Imperial Gold Luster Dust mixed with lemon extract to make a “paint” (pretty thick – if you thin it out too much, you won’t get good coverage). To give you an idea of how much you’ll need for a cake this size, I used almost two whole 2g jars of the luster dust (I had a little left in one jar). Someone also asked about the board for this cake. It was covered in Wilton Gold Fanci-Foil, then I added a white satin ribbon (see my tutorial for adding the ribbon here). 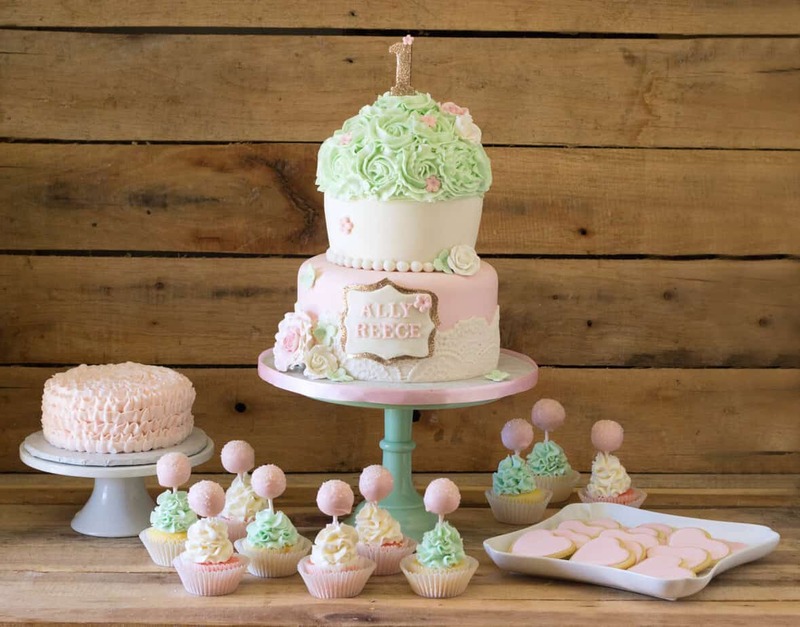 and the cake pops… so.much.FUN! 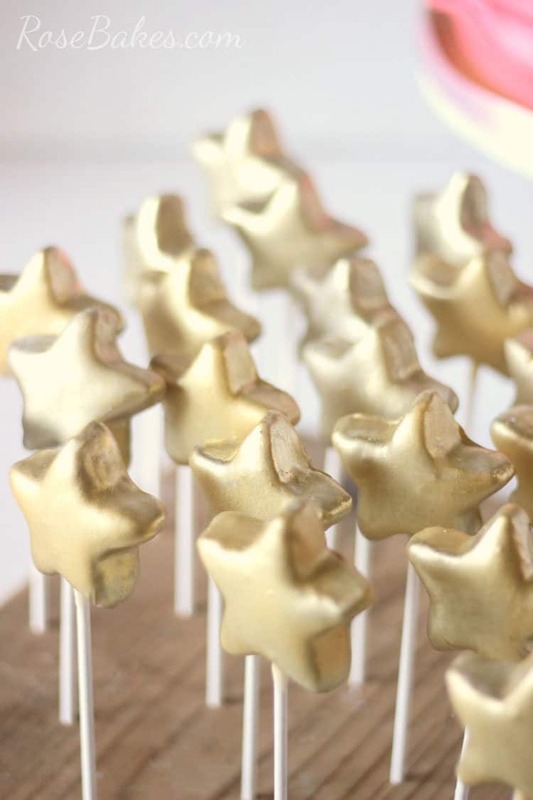 For the cake pops… I rolled out cake pop dough, used a star cutter to cut out the stars, placed them on lollipop sticks then chilled them for awhile. 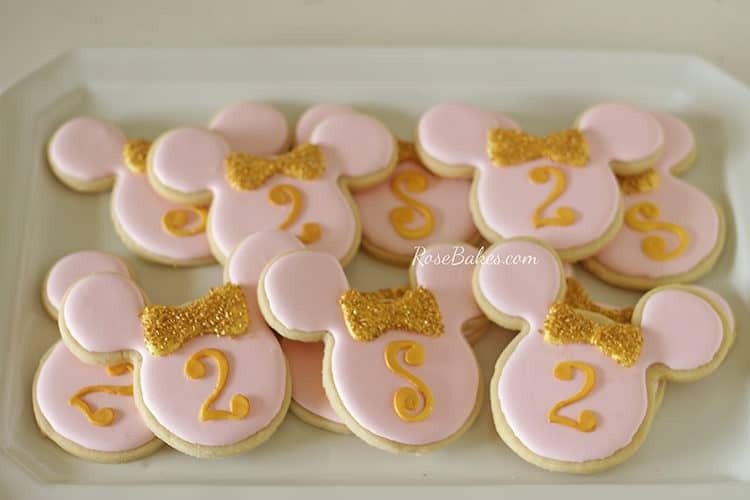 When cold, I dipped them in white chocolate candy melts, then sprayed them with edible gold spray! They were SO much fun to make! 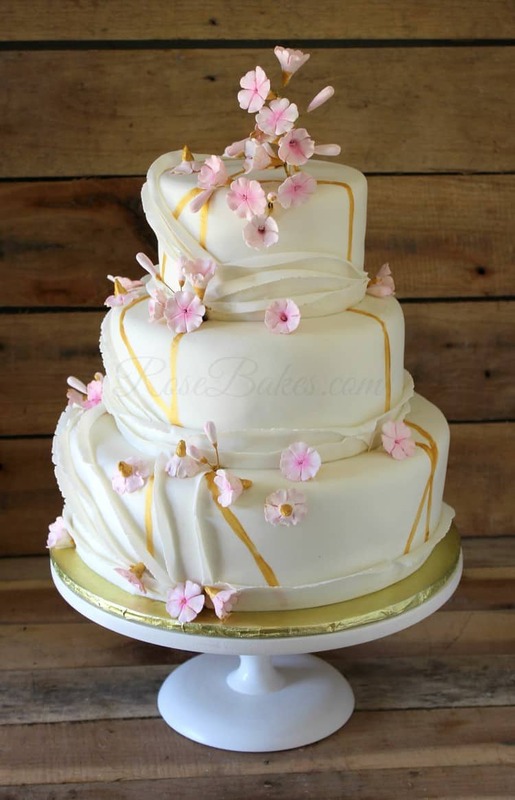 This cake only had a touch of gold in the centers of the wafer paper flowers and dusted on the petals. 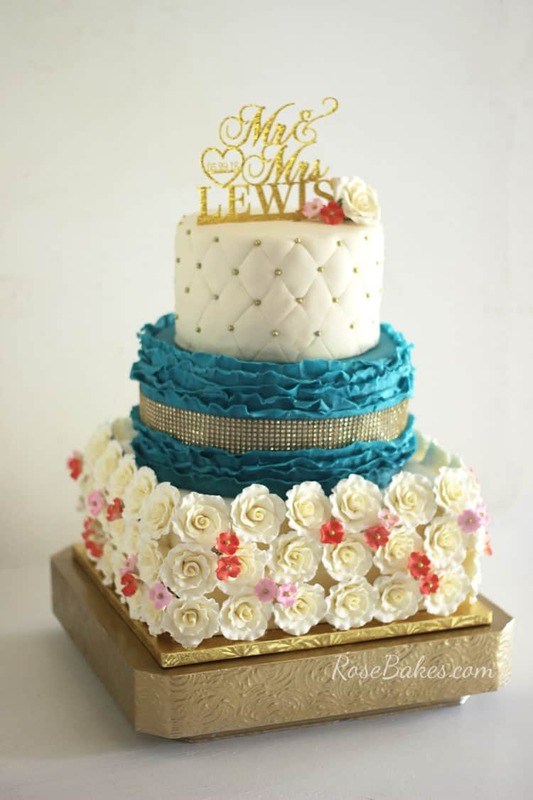 While this anniversary cake had an entire tier covered edible gold sequins! 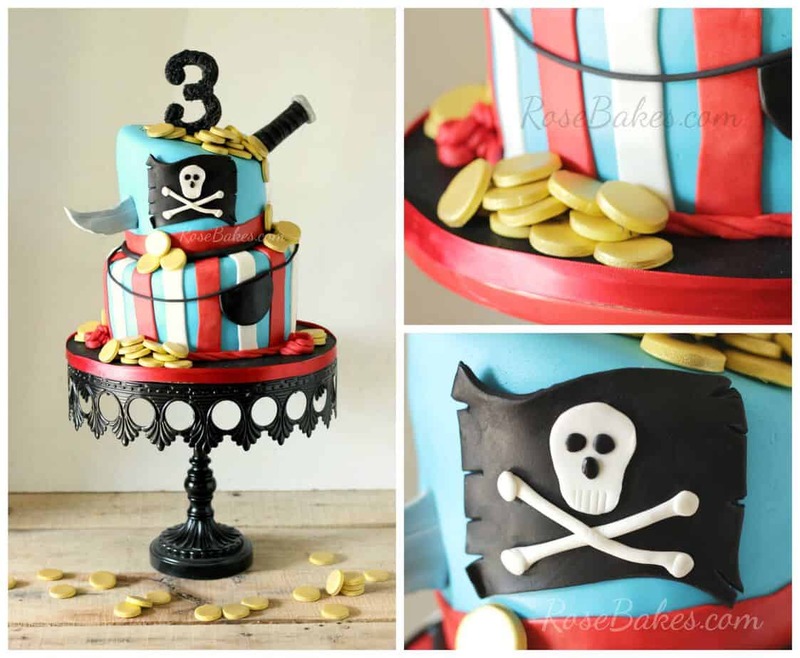 Click here for all the details on this cake! 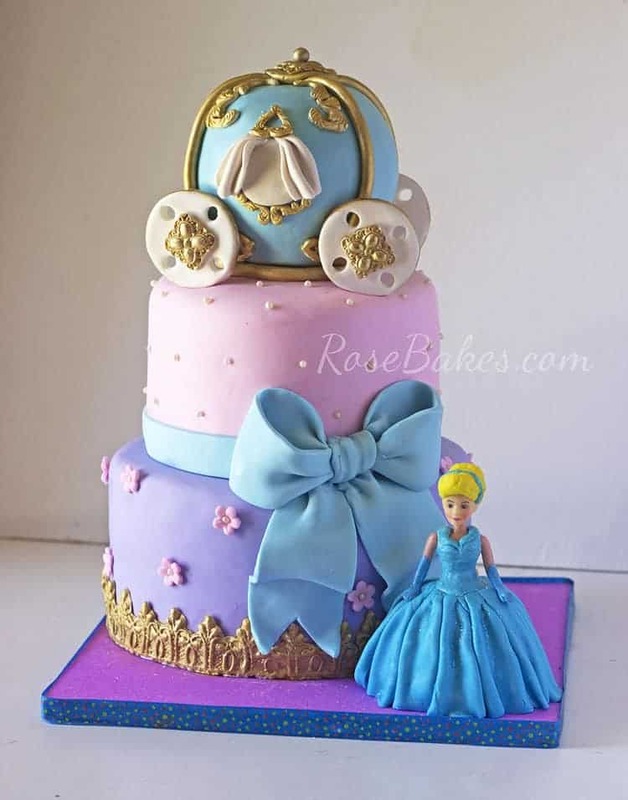 This sweet little princess cake is another favorite. 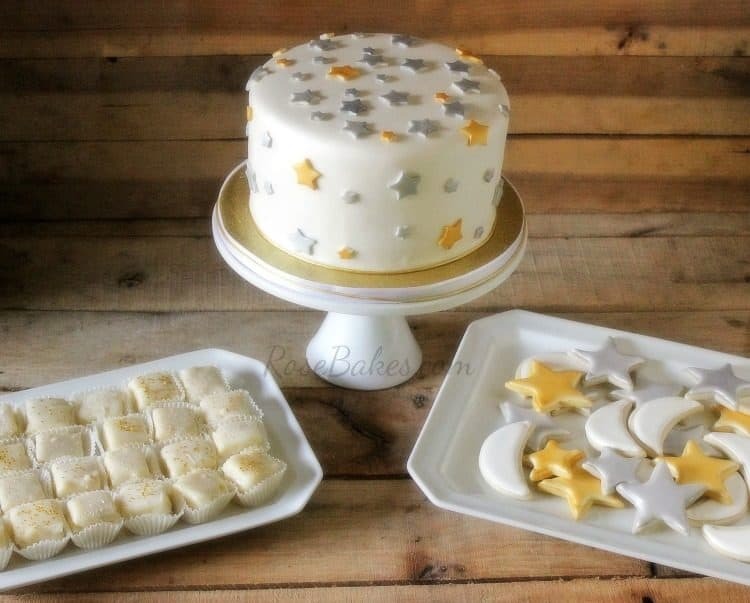 I think this was the first time I mastered the gold finish that I used on most all of these cakes! 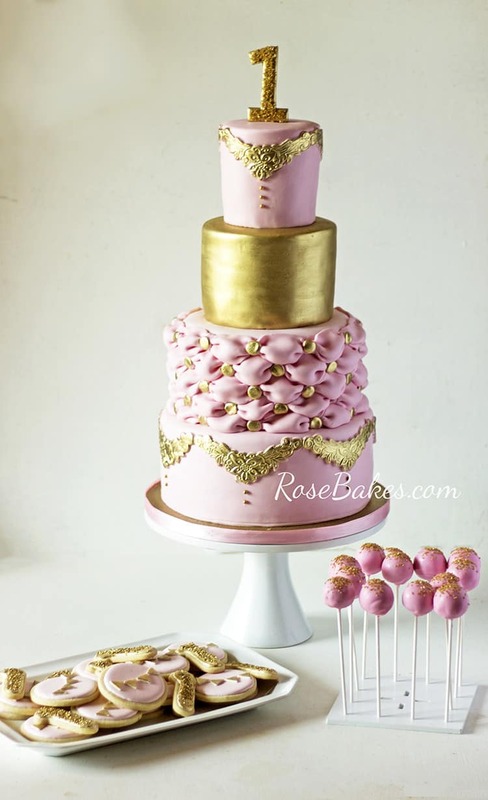 This smash cake didn’t have any edible gold elements, but I loved doing the topper and board with the gold glitter. See how I make the boards like this here. 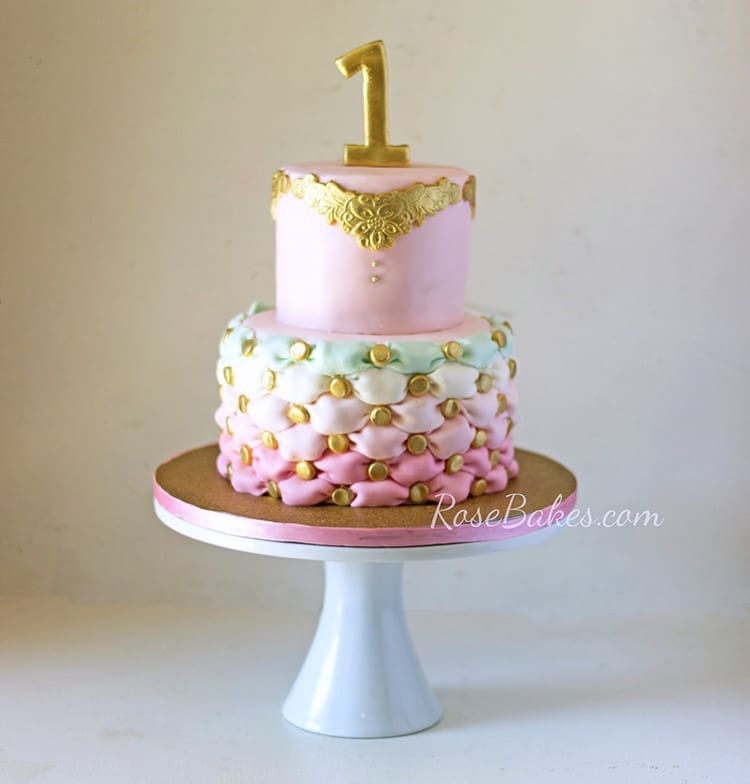 OH – and there’s this gorgeous 1st Birthday Cake. 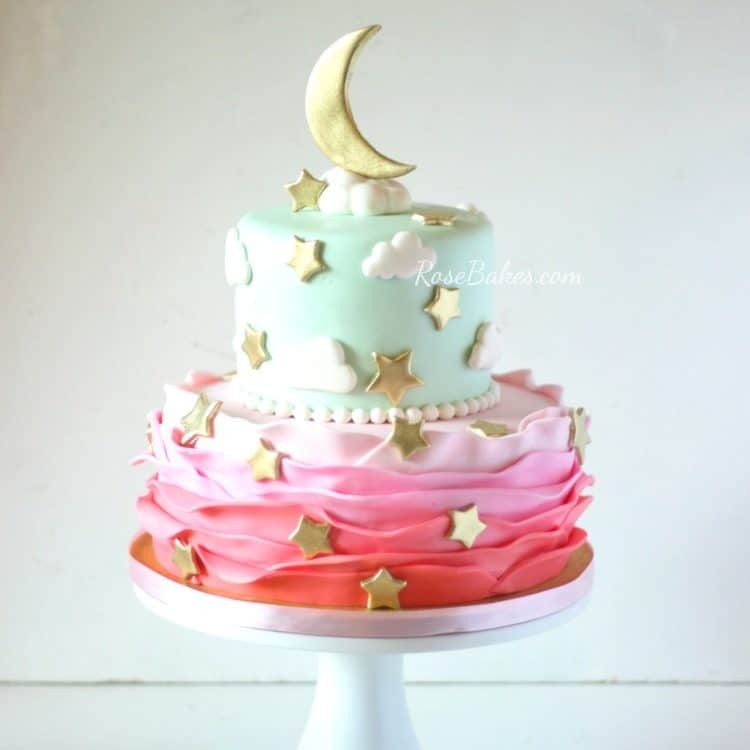 This dream of a cake was inspired by a cake found here and done by Frost It Cakery. My cake was 4″, 6″, 8″ and 10″ tiers of white almond sour cream cake with cream cheese frosting and homemade marshmallow fondant. 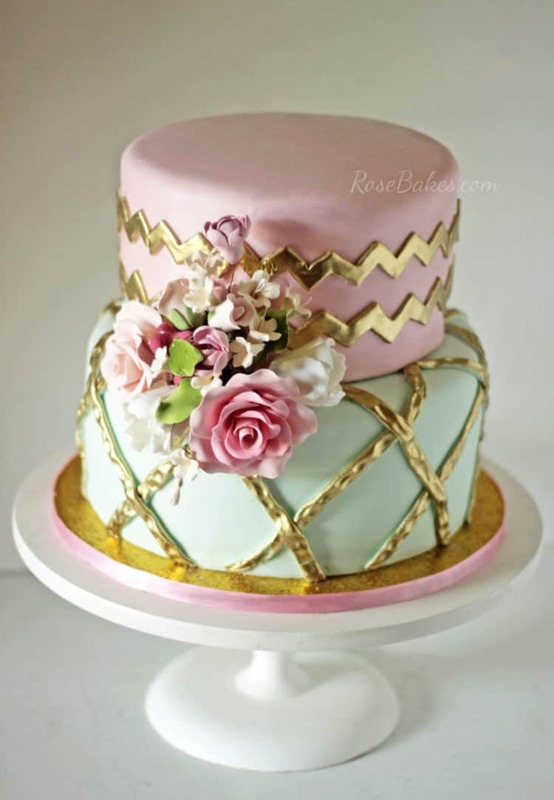 Here’s a smaller version of that same cake… with the added touch of mint green in the design! 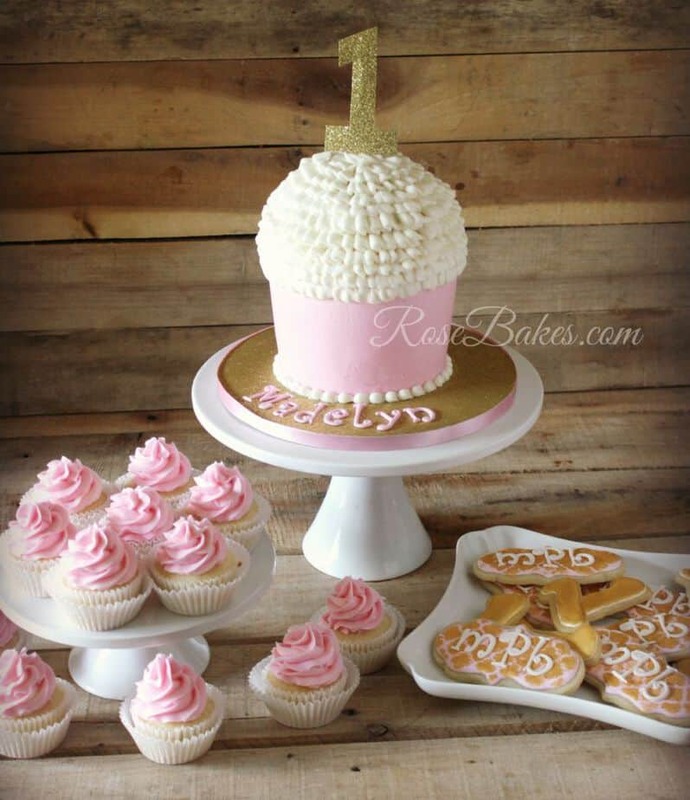 A Giant Cupcake Cake with cupcakes and Gold Cookies! The only hint of gold here was behind the plaque and on the “1” but I loved it so much!! 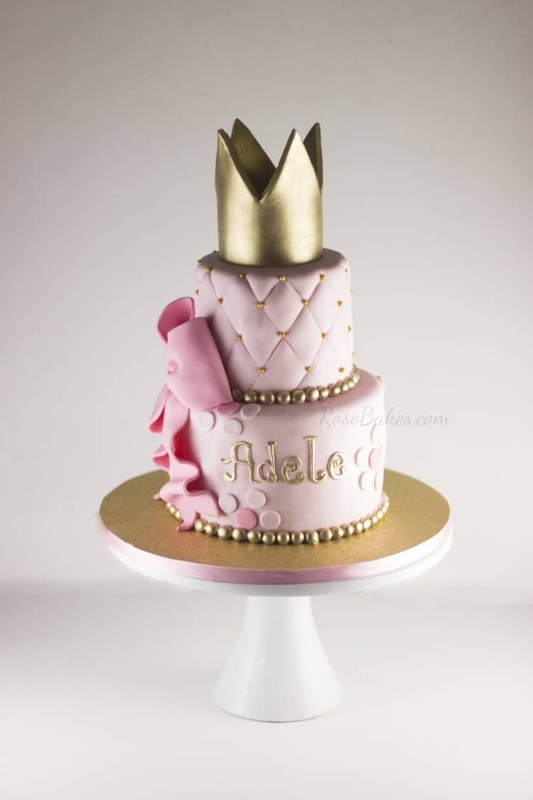 And this little Bunny themed cake (and smash cake)… just a touch of gold, but so pretty! 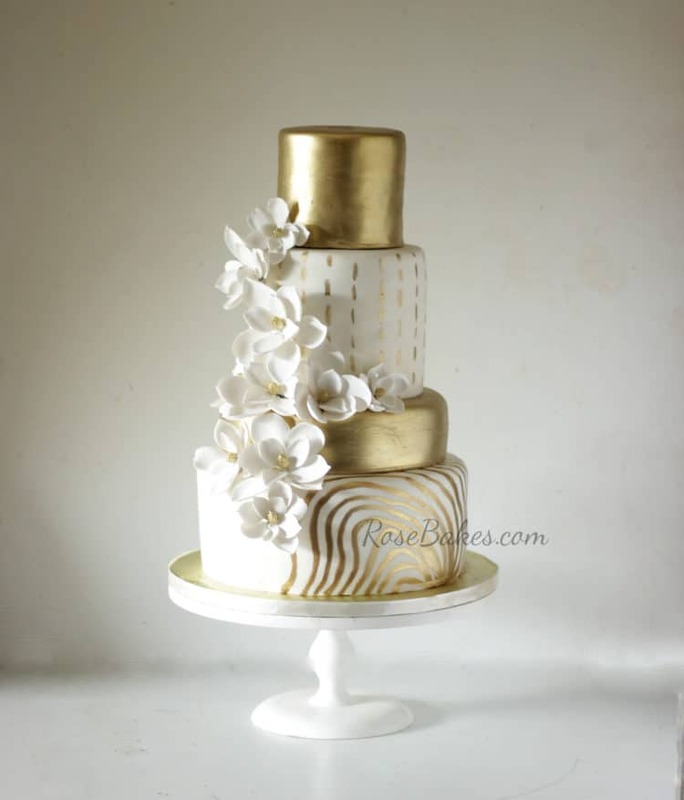 I love all gold theme cakes yours are beautiful!!! I just made a 3 tier all buttercream wedding cake that I handpainted all gold it turned out so pretty I can’t wait to try more making more gold cakes! These are all lovely – thank you for sharing. 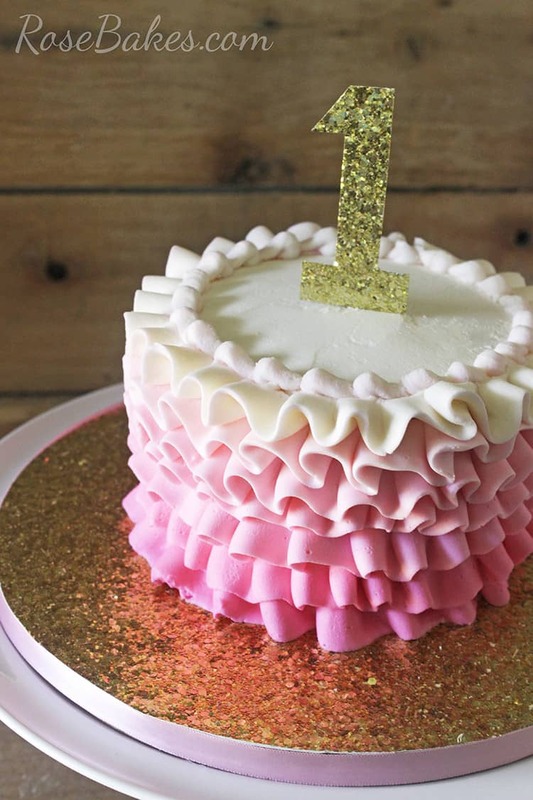 Your first cake – is that gold spray? How did you spray the lines – they look painted? What did you use to paint these lines? 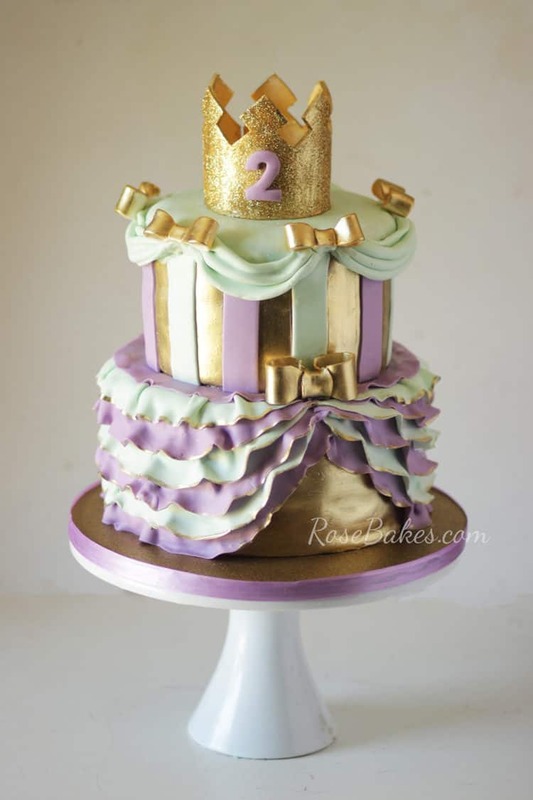 Hi Sherry – all of the gold on this cake was painted. I mixed luster dust with lemon extract and made a think paint then used a small paint brush for the lines and a wide brush for the solid gold tiers. I added links to the post above! Thank you for telling me how to do this. I will try it out in the next few weeks. thank you for sharing. Love all of theme. 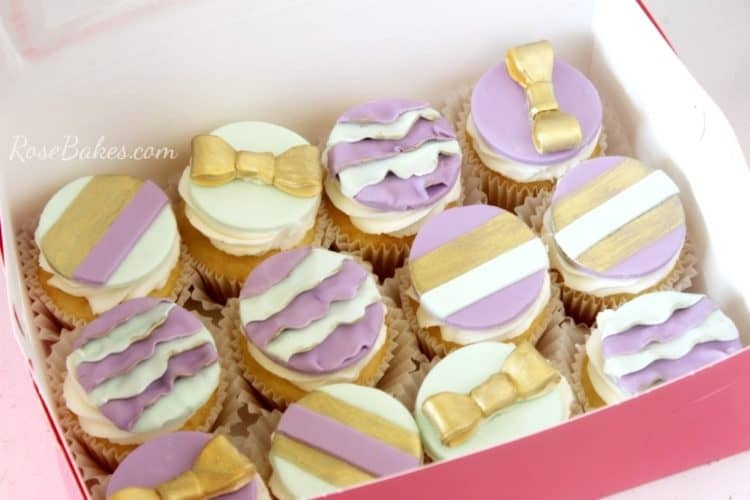 I have a question, Can you brush paint gold on buttercream ? I read once that you can if you let the buttercream crust first. But I’ve never tried it. I love the gold theme yours look amazing! 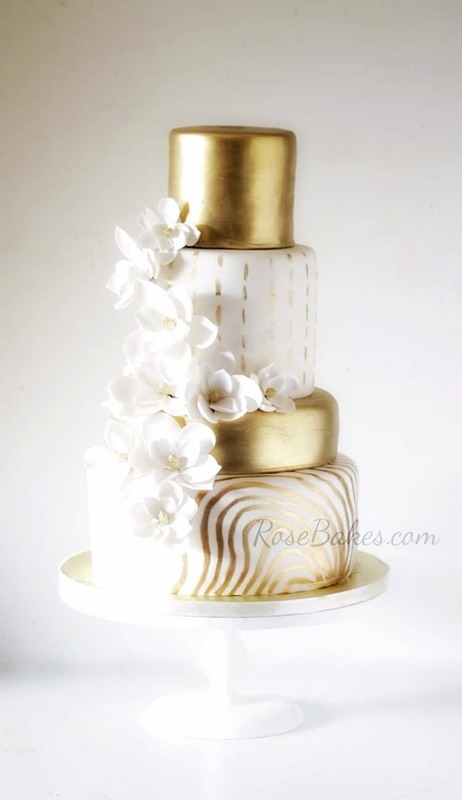 I made a 3 tier all buttercream wedding cake recently that I handpainted gold it took forever but it turned out pretty. I can’t wait to try more gold cakes! 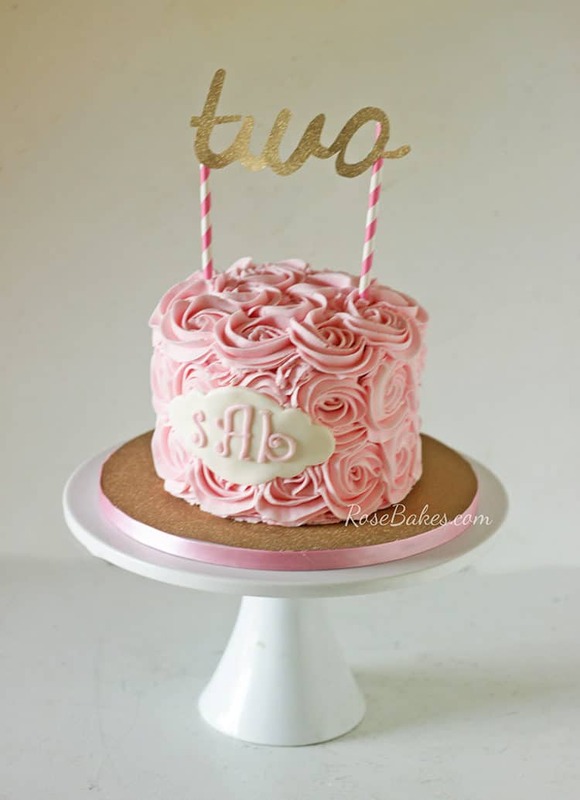 I would love to know how you were able to paint on an all buttercream cake? I have tried but no success. Hey Gina what I did was frost cake in a super stiff frosting, let it get really cold then I would brush on americolor gold I needed 2 coats on mine but I wanted a really deep gold color! Was your buttercream made with shortening or butter? I have only worked with shortening based buttercream. That anniversary cake is GORGEOUS! Was it painted with the gold lustre dust diluted in a liquid? I haven’t used gold yet, but would really like to soon. Also, did you paint the cake board or is it some type of gold paper? I’ve been trying to find different ways to cover cake boards larger than 12in. Yes, I used Imperial Gold Luster Dust mixed with lemon extract to make a “paint” (pretty thick – if you thin it out too much, you won’t get good coverage). To give you an idea of how much you’ll need for a cake this size, I used almost two whole 2g jars of the luster dust (I had a little left in one jar). The board was covered in Wilton Gold Fanci-Foil, then I added a white satin ribbon (see my tutorial for adding the ribbon here). I love your cakes! I love your blogs! You are creativity and talents are such an inspiration! 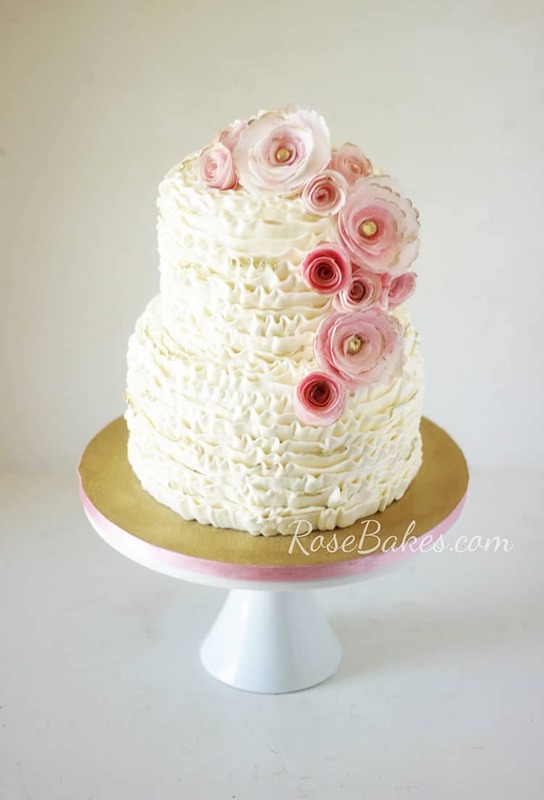 I was wondering if you generally make the fondant/gumpaste flowers on all of your cakes (not the buttercream flowers of course). If not, where do you purchase them from? If so, how do you find the time?! Hi Sheri – Thank you so much! So, I sometimes make my flowers but usually not. 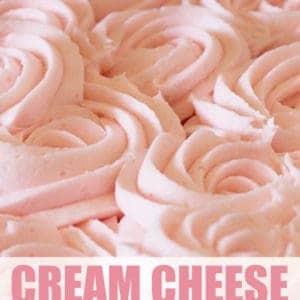 I buy from Wholesale Sugar Flowers, Calijava, and Cakes.com. I have also bought flowers from Etsy if I find something there I like! I love your blog, is very inspirational. I have a question about de anniversary cake, the gold sequins tire is covered in buttercream too? Thank you! I’m pretty sure I pressed the sequins directly into buttercream. 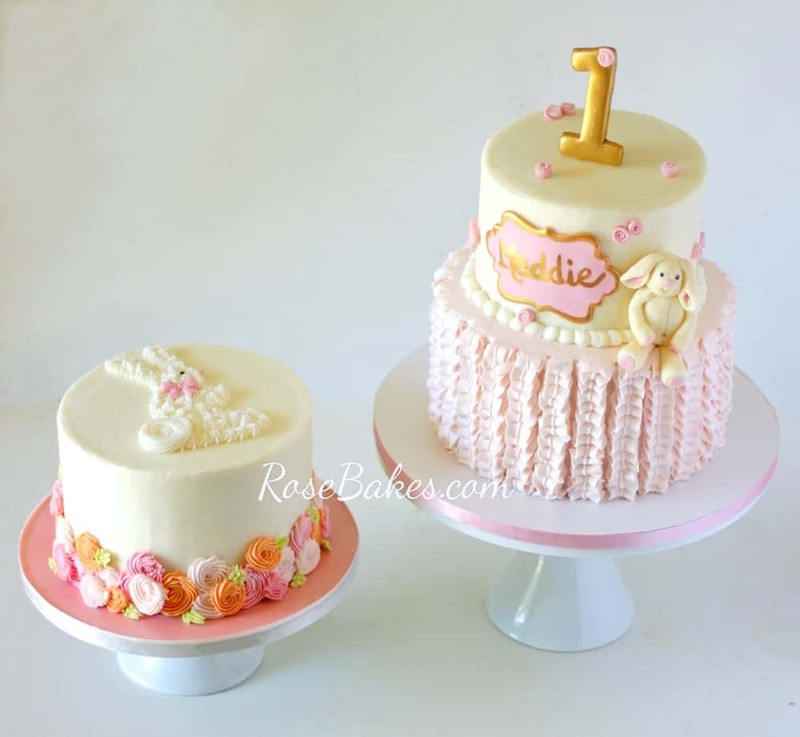 So many great cakes or cupcakes, I just love them all!